When I want “me” time, the best thing to do is pretend I’m a big shot guy and cook a big steak. This is the best way to make a steak at home, it always come out perfect and doesn’t stink up the house too much. Preheat the oven to 350 degrees. In a cast-iron pan or a nonstick metal handled heavy frying pan, heat olive oil on medium high heat. Sear the steak on one side. When it is browned and caramelized, flip it over, put in the oven meat thermometer and place it in the over. Cook it till desired doneness. Let the steak rest for 10 minutes. And then slice it against the grain. 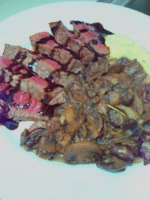 Serve with polenta, sautéed mushrooms and a reduced balsamic sauce.